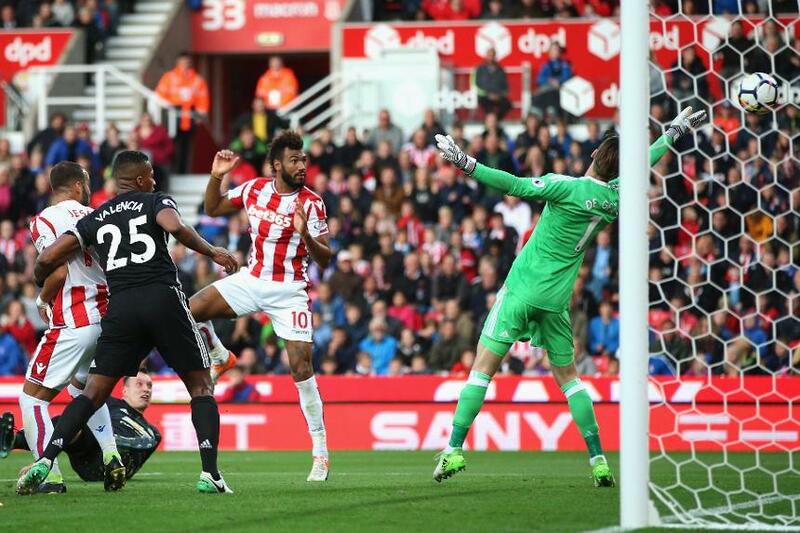 Eric Maxim Choupo-Moting scored twice as Stoke City ended Manchester United's 100% start to the season. The summer signing broke the deadlock on 43 minutes at the bet365 Stadium, converting Mame Biram Diouf's cross for the first goal United had conceded in 2017/18. But Marcus Rashford immediately equalised, deflecting in Paul Pogba's header. After the break, Romelu Lukaku made it 2-1 with his fourth goal of the campaign, following up after Jack Butland had saved his first shot. It was Stoke's turn to reply. Moments after David De Gea's heroics had denied Jese, Choupo-Moting headed in Xherdan Shaqiri's cross. Butland's stoppage-time save from Kurt Zouma's header kept United to a point that put them back top on goal difference. Stoke climb to 10th.